I made a little 3D 'crate' to add some Easter sweetness to. I should have bought the little chocolate lambs, but went with my Mom's favorites, Reese's. Power Poppy, Just Go 3-D.
Simon Says Monday, Beautiful Blooms. Stamping Sensations, April Showers Bring May Flowers. I used the Power Poppy stamp sets, Short Stacks and Potted Primroses. Amalgam Black ink and Copic Markers. Flowers and Pots fussy cut out. and offer you a sweet. 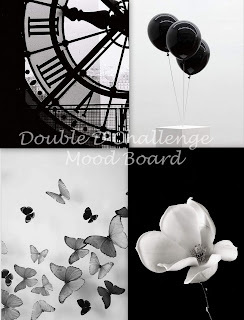 I was drawn to the balloons and butterflies from the Mood Board. Using an Embossing Folder I dry embossed my background in a Happy Birthday Motif. The balloons were created using the Impression Obsessions Birthday Balloon die. I sponged a bit of Dove Grey ink on the White ones to add a bit of dimension. I 'planted' them into the Simple Garden Pots die cut by Memory Box, adding Baker's Twine strings. The little butterflies were cropped using a Memory Box die, Butterfly Exhibit. A Vellum strip was heat embossed using Black Embossing Powder. Happy Birthday sentiment by Gina K Designs, Pleasant Plurals stamp set. Inside stamp also by GKD, Happy Spring. This card will be entered into the Simon Says Wednesday Challenge, No Designer Paper. 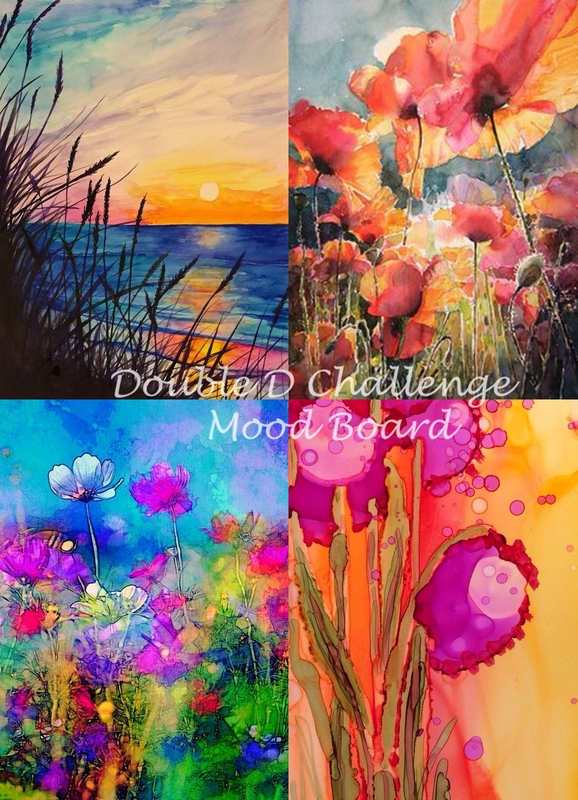 I have a couple of more cards to share with you today.....so off we go! Simon Says Monday, Beautiful Blossoms. Simon Says Wednesday, No Designer Paper. I used many dies for this layered creation. Memory Box, Lavender Bunch, Layered Robin. PTI, Shakers And Sprinkles Frame dies. I used Foiled Toner Sheets to create my Layered Robin. Sentiment by Power Poppy, Everything's Even Rosier, stamped in Amalgam Black ink. It was a lot of fun layering all of the different die cuts together. here's the first of many to come. 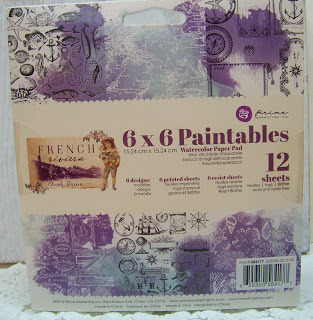 I used the Gina K Designs stamp set, Elegant Florals. Images colored with Colored Pencils and Copic Markers. Dew Drops created using Crystal Clear Nuvo Drops. Spellbinders Classic and Scallop Ovals. I love this Fun Fold! I kept each page pretty simple, but there is lots of landscape to stamp and decorate. I'm going to say that Spring has arrived here on Cape Cod....hope I just didn't jinx myself! The air is warmer and things seem to be greening up a bit. Simon Says Work It Wednesday, Spring Flowers. Power Poppy, On The Grid. I used the Everything's Even Rosier stamp set by Power Poppy. Stamped in Amalgam Black ink and colored with Copic Markers. Then I sliced the image up into 1" squares. But, first I added a sheet of double sided adhesive to the back of the image. Made it so much easier than using my large ATG Adhesive Gun. Placed all the images onto a piece of pretty Blue card stock and then swiped my Versa Mark Ink pad all over, doused with Clear Embossing Powder and then heat set it. This shines so much, looks like little pretty tiles! Of course, nearly impossible to capture in a photo. Added a sentiment stamped in Island Indigo ink and heat embossed with Clear Powder. 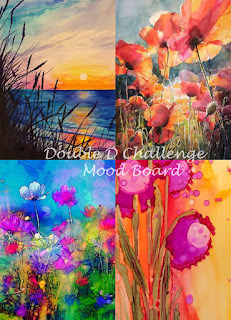 Challenge at Gina K Designs, Ombre Ink Blending. 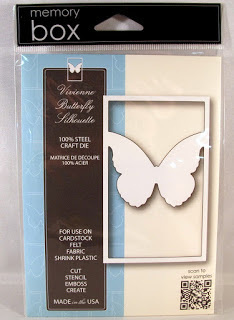 using Versa Mark ink and White Embossing Powder which I then heat set. and Calypso Coral I created my ombre background. which I also used my inks on to make the ombre effect. Added some 'dew drops' using Nuvo Drops in Crystal Clear. This is a pretty straight forward card. Nothing fancy, no frills. This Memory Box die cut, Row Of Poppies is one of my most favorite things to water color. They are just perfect! for a little bit of depth and dimension. Scallop Frame is from PTI, Shakers And Sprinkles. As you can imagine, this was a super quick card to create! Memory Box, Clean And Simple. Dies R Us, Anything Goes!